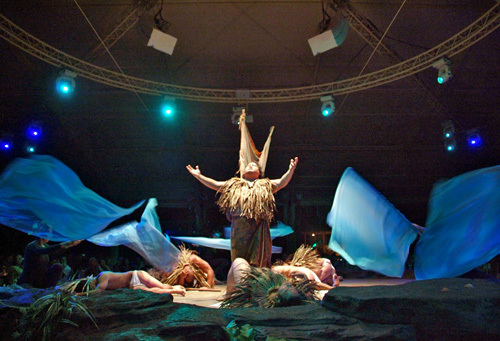 A year-round Hawaiian luau held in Kauai, Lu’au Kalamaku offers a thrilling experience beneath the island’s beautiful night skies. 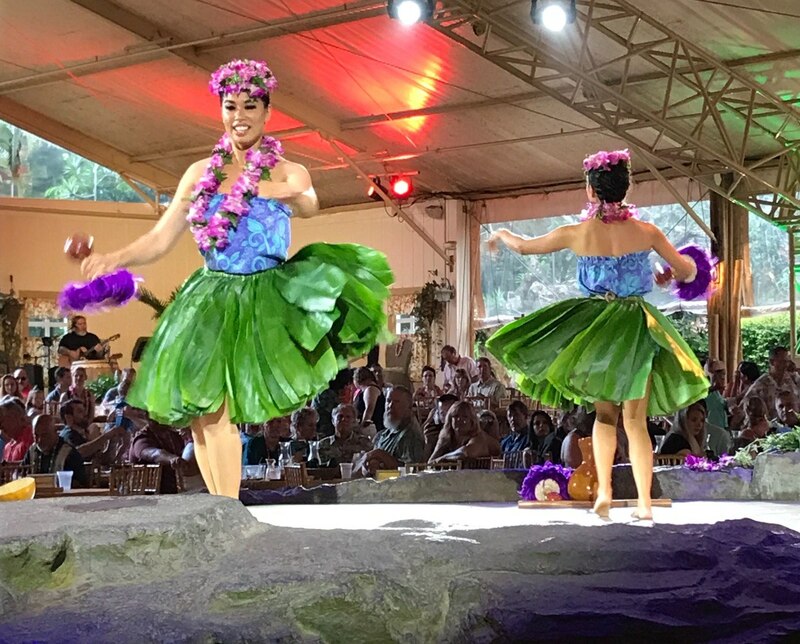 Guests can enjoy hearing an incredible story about the original days of the Hawaiian people, seeing traditional fire-knife dancing and fire poi-ball twirling, dancing along with enchanting music, sipping an included beverage with the show, and more. Luau includes 2 complimentary drinks. Additional beverages are available for purchase. Gluten Free, Vegetarian & Vegan menu options are available. 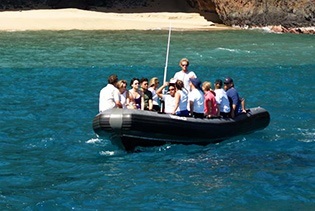 Guests must provide their own transportation to the luau. Parking is available. Lu`au Kalamaku is an unforgettable experience and a "must-see" for any visitor. 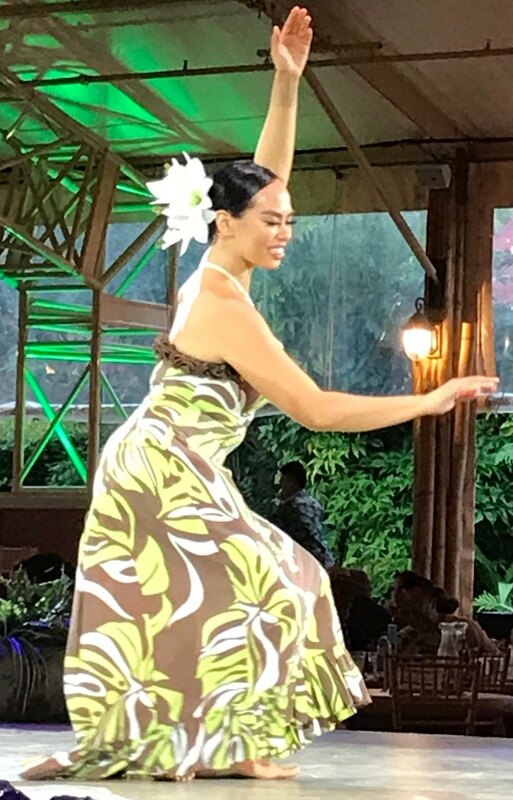 It's the state's only lu`au show performed "in-the-round", offering great views from every seat. 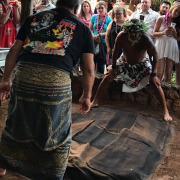 The evening begins with craft and cultural demonstrations and Hawaiian games, followed by the traditional imu ceremony. 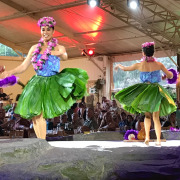 Guests are treated to delicious traditional local cuisine, while hula dancers and musicians entertain. 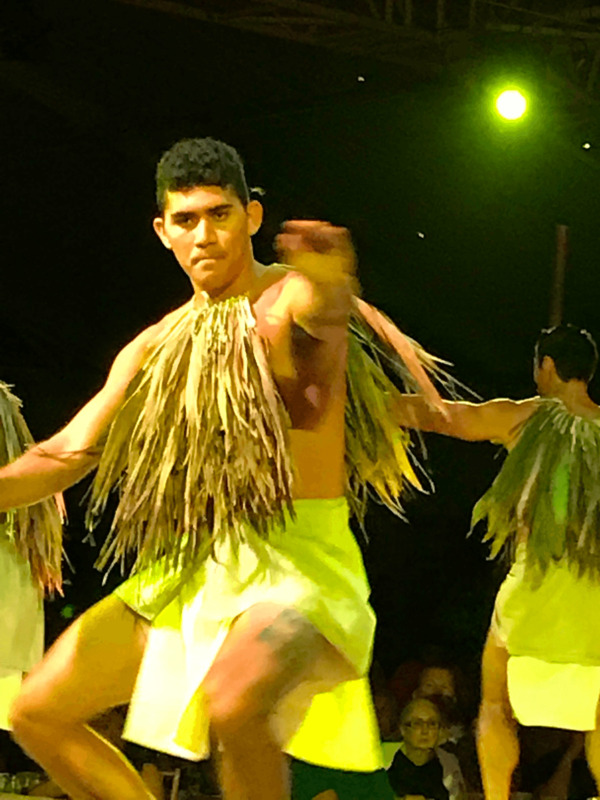 The 45-minute main show tells the amazing story of the ancient Hawaiian legend of Kalamaku, "child of the new land" and the epic voyage taken by islanders between Tahiti and Kaua`i, featuring fire poi balls and traditional fire knife dancing. Includes 2 complimentary drinks. Additional drinks available at extra charge. Kauai fresh green salad with choice of dressings, Potato macaroni salad, vegetarian tofu salad, Fresh pineapple and papaya platter, Lomi lomi salmon, Taro rolls, Vegetable chow mein, Steamed jasmine rice, Hawaiian smashed purple sweet potatoes, Yellow curry ratatouille, Teriyaki chicken, Pan seared Ono with tartar sauce, Kalua pork, Poi, Rice pudding with dark rum sauce, Haupia, Banana cream pie, and Pineapple upside down cake. *Menu includes Gluten Free, Vegetarian & Vegan options. Menu subject to seasonal changes. 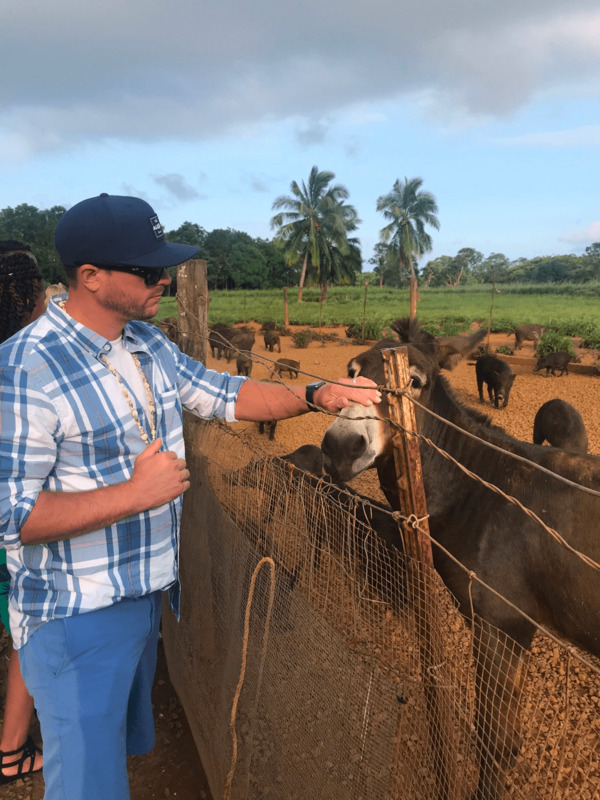 Train Ride Option: Offers guests a chance to travel through the 105-acre historic Kauai Plantation. Your conductor will guide you along historic plantation homes, travel through a lowland forest, and view endless fruit fields. Then disembark to feed a herd of wild pigs, goats & sheep. Out of all luaus I visited this one honestly was the best. Very professional entertainment. Excellent food. Very organized and friendly stuff.. Tip: Be patient with long lines. 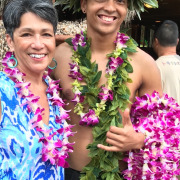 "a luau like no other"
our family had a great time. 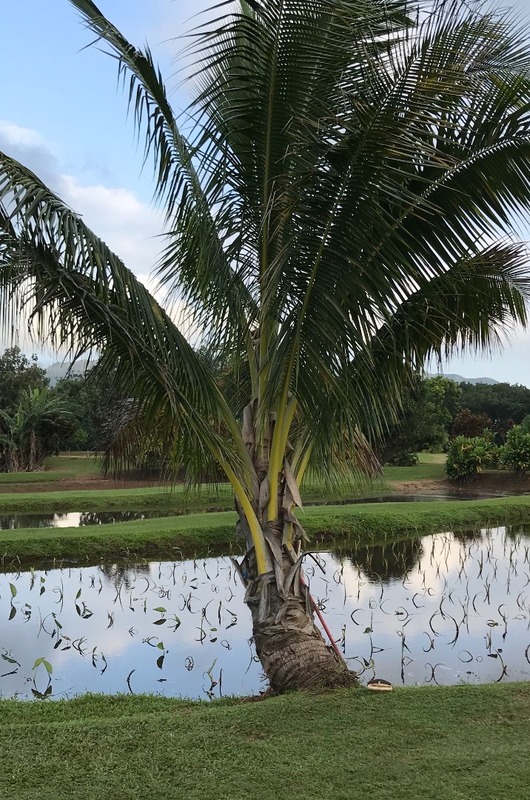 the grounds of the plantation are lovely. we rode the train around the grounds and learned a lot about the many fruits grown there. 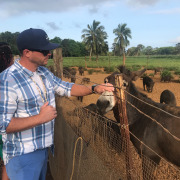 had a chance to feed and visit the animals. 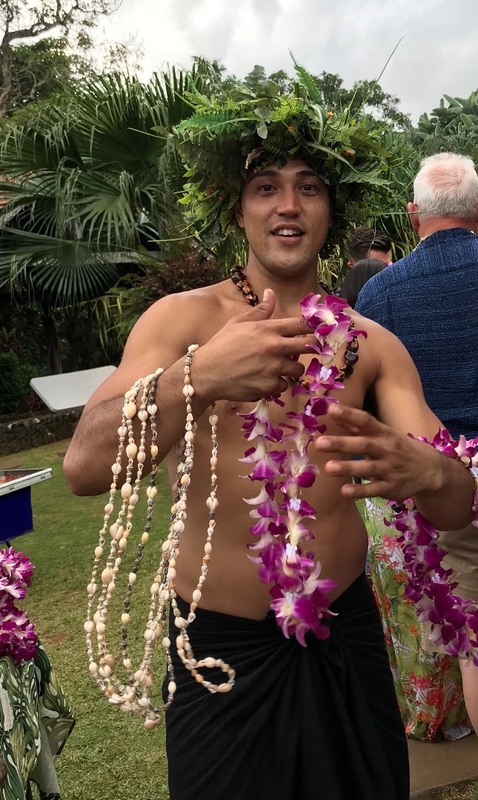 loved the fresh leis and male equivalents and the history of the plantation. 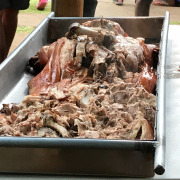 there was a great variety at the buffet and an opp to experience the process of the roasted pig's removal from the underground pit. the dancers and performers were outstanding and their presentation and historical act was very entertaining. recommend bug spray as the lighting did attract bugs as the luau is in a lovely open pavilion...a must see for any Hawaiian visit. 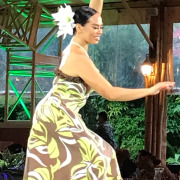 FIRST TIME VISIT TO HAWAII AND READ GREAT REVIEWS ABOUT THIS DINNER SHOW. TOLD IT WAS A MOST SEE WHILE IN KAUAI. GREAT FOOD, AMAZING ENTERTAINMENT. Tip: COME ON AN EMPTY STOMACH, TONS OF GREAT FOOD. The dance and story were wonderfully presented. The pre dinner open bar and vendors was a nice opening to the evening. The meal itself was average. It was like any large event buffet. The quality of the food could be a little higher for the price paid. Tip: Arrive early and if you don't have a large party, expect to share a table with others. great place. Ambiance super. Loads of drinks. Great food. 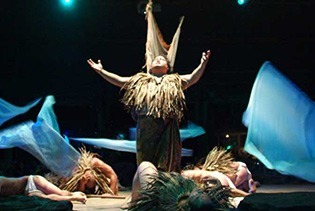 The dance /story of how people came to the islands...wonderful. Dancers were excellent. Very entertaining and beautifully done.Total entertainment and educational as well. 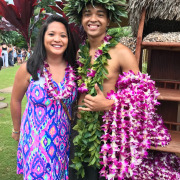 The Luau was an awesome experience and the show was phenomenal! Staff was friendly and things ran smoothly moving everyone through the buffet line. Definitely worth the cost and time. 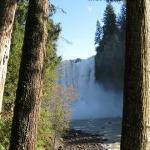 "Great show - food was okay"
We booked this tour via our cruise line NCL. The logistics to get there was easy. 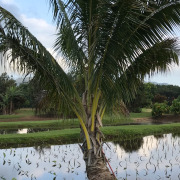 The former sugar plantation turned into a very commercial enterprise is beautiful, lush and very well organized. The grounds are well maintained and colorful. However, the huge outdoor facility can hold up to 750 people with a stage in the middle of it. It's not intimate by no mean. 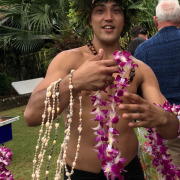 As we made our way to the big tent, we were given a beautiful fresh orchid lei and kept going through the ropes, like cattle, to have pictures taken which we had to pay for later on..(for the price of the event, it would have been nice to get it for free). We were seated away from the stage but had an elevated view so no complaint there. 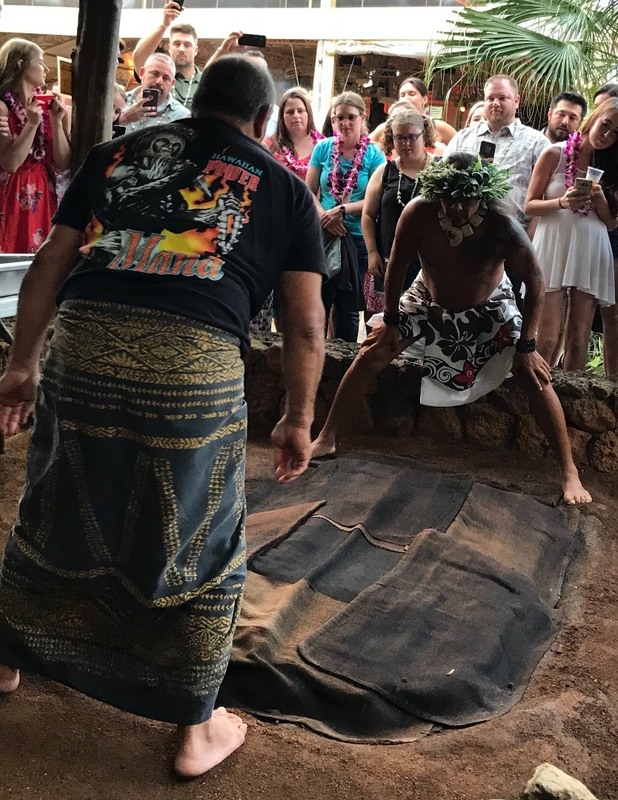 If one wanted to be sure to get a closer table, it was an upgrade (it felt like a money grab to me)..We were able to walk around the grounds and observe the tiki sculptor, local musician and buy trinkets made in Hawaii before the dinner/show started. We had 2 drinks included with dinner - quality was medium. Staff were very well organized with the bars, serving the nibblies, salad and bread to enjoy while we waited to be called to go to the buffet stations that were set up at many points around the space. 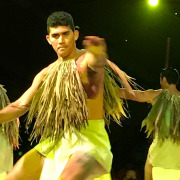 A lot of warnings were done over the public address system about the risks surrounding the dancers handing fire and to be careful moving around during the show. It was a SPECTACULAR show and even if the food wasn't that great, the show was. The story telling, the display of the culture, the meaning of movements and beliefs of the islands was great to be learned. 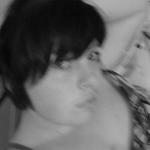 I'm glad I had the experience - Be selective of which one you go to! A beautiful place to have a Luau and have fun. The pre-dinner train ride around the grounds provided a guided tour of the property and a little history at the same time. The open bar and the food was excellent. The show went on for over an hour and was not disappointing in the least bit. I would heartly recommend this event to anyone on the island, it is well worth visiting. If you want a $125 per person buffet and a sound system that makes it impossible to hear words and poor sight lines and to be stuffed along tables where your legs hit the table with 1500 other people then this is for you! Our family was unimpressed and disappointed. I font recommend this activity. 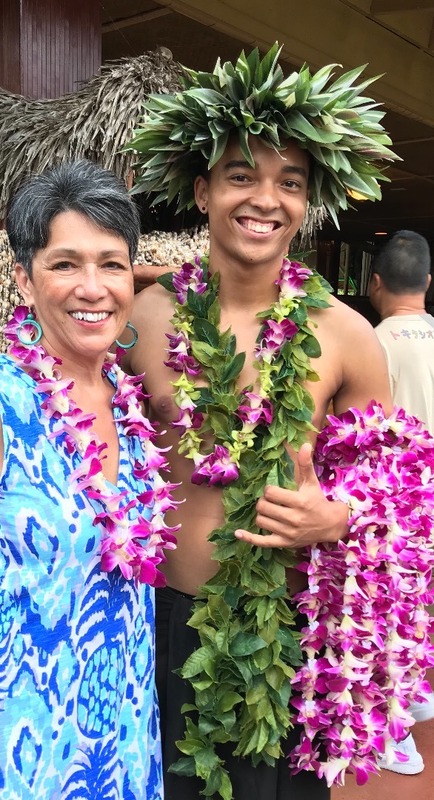 You will want to arrive around 5:00 pm to enjoy craft demonstrations and Hawaiian games. 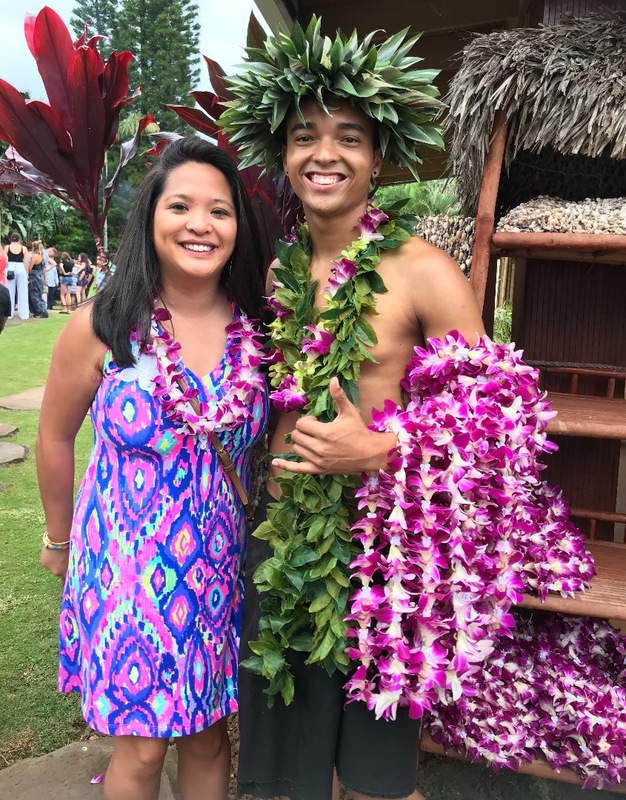 Where is the Luau located? The Lu`au Kalamaku is located on Highway 50 next to Kauai Plantation Railway station at the far left end of the parking lot. Are drinks or alcohol included? Yes, an open bar is included with the Gold or Regular seating. This includes tropical drinks, mixed drinks, local beer, wine and non-alcoholic beverages. What is the difference between the Gold and Regular seating? 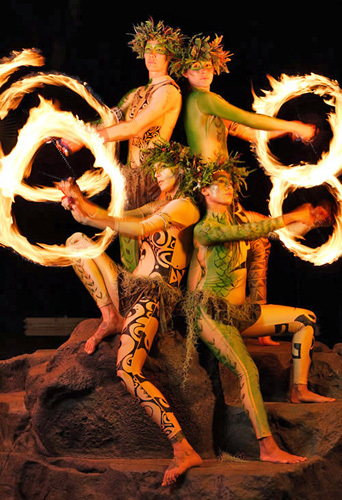 Gold seating gives you seats so close to the stage that you can feel the heat from our famous fire dancers. If I purchase the Train Ride, what time is that? You will want to catch the train at 5:30 pm from the Depot. We suggest you plan on spending 3.5 hours total. 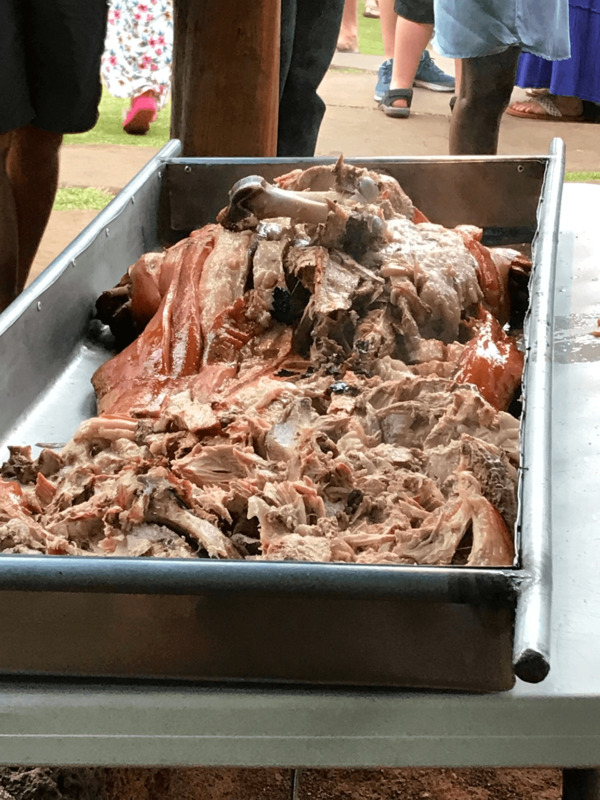 Does the luau operate in inclement weather? Our expansive covered showroom is equipped with an “in-the-round” stage setting, enabling guests to a grand view that allows them to feel like they part of the show. The facility, while covered overhead, lets the show go on rain or shine, yet still allows you to enjoy the tropical surroundings. No, transportation is not included. You must provide your own transportation to the luau.